As we have been discussing lately, rolling out a BYOD Program can generate a lot of interesting conversations with students, parents and teachers. Many people do not feel they have the information in order to make informed decision and to set up good routines and habits around tablet use. 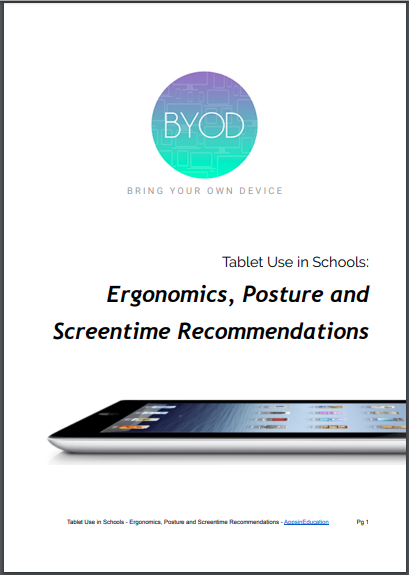 I admit that this paper 'Tablet Use in Schools: Ergonomics, Posture and Screentime Recommendations' is a bit of overkill at 46 pages but it is not meant to scare people. Refer to the different sections as you need them or have a concern. It is a paper that I would recommend teachers have a look at so they can answer questions from concerned parents about class and home routines for tablet use. The most basic advice that I continue to give parents, and sometimes schools almost have to give parents permission to say this - 'It is your house therefore your rules'. Do not let your kids put one over you by suggesting they have hours and hours of homework that must be completed on their device. Good communication equals good device use. You may be aware that the Horizon Report was recently discontinued. I have previously published an infographic on the Horizon Report 2014. It was always an insightful read each year when it was released. The Consortium for School Networking (CoSN) has kindly stepped into this space and announced that they would publish 'The CoSN Driving K-12 Innovation' publication. This will be assisted by the CoSN Driving K-12 Innovation Advisory Board. Today I was very happy to learn that I had been invited to join the 2018 CoSN Driving K-12 Innovation Advisory Board. The CoSN Driving K-12 Innovation Advisory Board is a body of K-12 edtech experts who will engage in online, asynchronous discussions to select the topics to be featured in the Driving K-12 Innovation publication. The advisory board is global in makeup, comprised of school administrators, educators, technologists, learning designers, and other practitioner/changemakers focused on spreading innovation in teaching and learning. The Advisory Board discusses and selects the top Hurdles, Accelerators, and Tech Enablers that are transforming teaching and learning. This publication is produced in order to inform educators of those innovations that can have a significant impact on the education of their students. Anzac Day is held on the 25th April and remembers all those that have fallen in battle for Australia and New Zealand. ANZAC stands for the Australian and New Zealand Army Corps. They have fought in many famous battles in countless theatres of war and and have been enshrined in both Australian and New Zealand history. I was interested to see if anyone had developed any apps to showcase the information and subsequent legends that have grown up around the ANZACs. 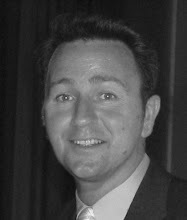 Thankfully there were a range of apps and a number of the apps I did find were developed by the Australian Broadcasting Commission (ABC) an Australian government organisation. I think because these were developed by the ABC they are distributed for free. Explore the events of Gallipoli in a 3D map space. From the first sightings of British Naval ships by Ottoman platoons and the unfolding chaos of the pre-dawn landings, to the ANZAC struggle to make gains in the unforgiving terrain. It’s WW1, and the battles of Fromelles and Pozieres, are raging. Hear the story of these battles narrated by Hugo Weaving while you explore 3D battlefields and trenches to gain an understanding of how WW1 battles were fought. It’s WW1, and the battles of Polygon Wood and First Passchendaele, form a key part of the Third Ypres campaign. Hear the story of these battles narrated by Richard Roxburgh, explore 3D battlefields to gain an understanding of events. Anzac history is brought to life in this interactive documentary detailing the Battle of Beersheba and its pivotal role in the Middle Eastern theatre in WW1. Explore the battlefield in 3D and dioramas to gain a rich understanding of these remarkable events in Australian history. Using real 3D locations and featuring original museum artefacts, historical interviews and videos; witness the famous Kokoda Track campaign of WWII. App comes educational resources linked to content Australian History Curriculum. Spirit of Anzac Centenary Experience tells the story of Australia’s involvement in the First World War. It begins in pre-war Australia, before transporting you to recreated scenes of Gallipoli, the Western Front, Sinai and Palestine. A guide to the battlefields of the Gallipoli Peninsula. Follow in the footsteps of the Anzacs, with interactive trails, audio guides and maps. Explore the history of New Zealand’s involvement at Gallipoli with fully researched historical guides. Explore 6 case studies of people who served in the Australian Army in WW1. The app gives you an idea of what research of a soldier or nurse might look like. Research links and the collection of primary source documents will guide you. The Victoria Cross tells the story of the heroic deeds of soldiers during WW1. The heroic actions of these soldiers left their mark on history. In recognition they were presented with the most prestigious British and Commonwealth Armed Forces military award: the Victoria Cross. The Remembering Them app provides a geo-coded list and historical descriptions of thousands of memorials, museums, shrines, statues, monuments, wartime bases, war graves and other Australian sites that commemorate our wartime history. I would love t add to this collection if anyone k ow of any other suitable apps.